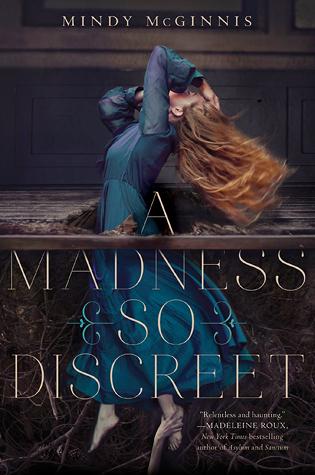 A Madness So Discreet is a dark and disturbing, absolutely wonderfully unique, one of a kind story and I LOVED every single second of it! Mindy McGinnis is a seriously talented author, with a brilliant imagination and a beautiful writing style. This was the first of her books that I have read, but I can assure you that it won't be the last. Grace Mae is a young woman, living in a society where the word of a man can get a girl thrown into an asylum, evidence or no. After getting pregnant by an awful man, against her will, she is taken to an asylum. She has decided that she will no longer use her voice, she will keep it all inside of herself, and stay alive long enough to have her baby. After, she is more than willing to die, rather than live with the perfectly recalled visions she sees whenever she closes her eyes. Then, she is invited to a dinner with the head of the asylum, and several other "passable" patients, There, her voice is finally let loose, along with her burning rage. She ends up in the basement, in the dark, drowning, until a voice intervenes. His name is Falsteed, and he becomes her friend and confidant and ultimately, her rescuer. Here, she also meets a doctor who comes to town to perform lobotomies on the worst of the patients, and a plan is devised to get Grace out of the asylum. She becomes Dr, Thornhollow's assistant, living in an asylum far away from home. Presumed dead, and safe, she blossoms in this asylum where the patients are well loved and fed. She makes friends, and learns things about herself, and the rage burning within her, along the way. There is so much more that I want to say. This book is just so good, I could go on and on. But I don't want to ruin it for you. The plot is interesting, and I was fully engaged in the story beginning to end. It wasn't a fast-paced story, but the nuances and the intrigue and the setting and characters were all more than enough to keep my attention from ever wavering. When I finished the final page, it was with a smile on my face. Grace Mae is a character all her own. There is no other MC that I can think of that comes close to her. She is strong-willed, and stubborn. She has a fierce, raging anger burning inside of her, and every right to it. She is smart, clever and strong. She made some dumb decisions along the way, she made excellent observations, and she made one horrible choice. Even then, I had gotten to know her and love her enough to understand her why. Her friends in the story make such an incredible impact on her, and they were such a bright spot in the story. As for Falsteed, there is no one like him. I LOVED his scenes. And finally, Dr. Thornhollow was so perfectly imperfect and I loved him in a big way. In the reviews that I have read, I have seen people say that there wasn't a romance. And that is true, in the traditional sense. And it is okay; it doesn't take anything away from the story at all. However, to me, I feel like, while it wasn't a traditional romance, there was a romance there. There wasn't any kissing or declarations of love. But there were small things, little moments here and there, words said and actions made on both Grace and Thornhollows parts, that I feel like, if their story were to continue, it would be there. Maybe I am crazy and it is wishful thinking though! Romance or not, lightning pace or not, A Madness So Discreet was an undeniably amazing story. I loved the dark mood, throughout 97% of the story. I loved the other 3% of lightheartedness too. I would recommend this book to you if you like a darker story, with some true grit. If you aren't a fan of the darker, almost gothic stories, I don't know that this would work for you. But my advice, wanted or not, would be to give it a shot anyway. It might surprise you! Thank you so much to Around the World ARC Tours, for sending A Madness So Discreet to my corner of the world! I'm glad to see you liked this one! I've seen it around a lot and I've been pretty intrigued by the premise. It sounds incredibly amazing. I love the cover too. I've yet to read a book by Mindy. Great review!